Nobles Plastics - Fascia/Soffits/Guttering based in Washington, Tyne and Wear. 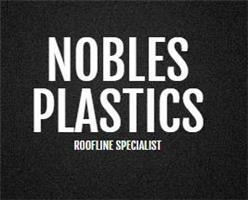 NOBLES PLASTICS are based in Washington Tyne and Wear and cover all North East areas. We specialise in replacing old and tired guttering and fascias with new uPVC products with a range of styles and colours to suit your home. We pride ourselves in quality of work and go beyond our means to make sure that our work stands out from the rest. We have our own access equipment which enables us to span "MOST" conservatories & porches, which in return can save the customer £££ on extra scaffolding costs. OTHER SERVICES... include Cladding, Dry Verges and Dry Ridge, EPDM rubber roofing, making your roof as maintenance free as possible. All quotes are in writing and held for 90 days so if your thinking about having work carried out in the near future give us a call. All quotes are totally FREE with no hard sell and are completely FREE of any obligation.